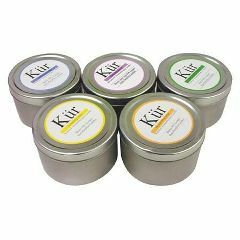 The wax in these candles is an all vegetable, 100% Natural Soy Wax with no chemical additives. No paraffin, no petroleum. Soy candles burn clean with no carcinogens with a 50% longer burn time than normal paraffin candles. Collection includes one of each of the following: Nurturing Nectar, Calming Lavender, Rejuvenating Ginger, Energizing Citrus and Refreshing Rosemary.